It is not widely known that, during the Second World War, thousands of Italians in Britain were interred. Edith’s War (Axiom) tells that story from the viewpoint of a woman i n Blitz-plagued Britain. Edith Maguire is awakened from apolitical torpor when the lives of her Italian neighbors are forever altered by war. Edith’s War is told in a sliding timeline: in the near present day we see the effect from the viewpoint of Edith’s sons, Shamus and Will. In 1940, their mother is shocked to see the changes that fear manifest on her neighborhood... and her neighbors: the cause. Though author Andrew Smith’s work has been included in the prestigious Journey Prize Anthology and shortlisted for the CBC Literary Awards, there is a stilted quality to his voice in Edith’s War that keeps the reader at a distance. Still, this is fascinating material and Smith covers it well enough. 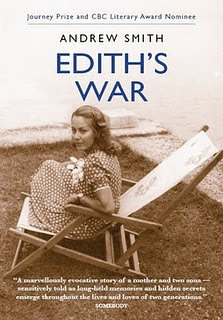 Edith’s War is well worth reading: the book is entertaining and informative, even if the prose never quite soars.